I found myself on New Years Eve wondering what I was going to do to bring in the new years. My husband had to work, my baby and I were still recovering from a very bad cold, and everyone I knew had somewhere to go and something to do. So I had to face the reality that I was speeding a night in just me, two rambunctious boys, a grumpy toddler and a demanding five month old baby. In my mind there was only one thing to do. Make the most of it! This stage of life is messy and nothing ever goes according to plan and if I just called it quits every time something is a lot of extra work or I wasn't feeling up to it we would never get anything done or make any memories. Sure I wanted to call it quits around 10 pm but I'm so glad I didn't! It was all worth it the next day over hearing my boys tell their dad what a great night they had. 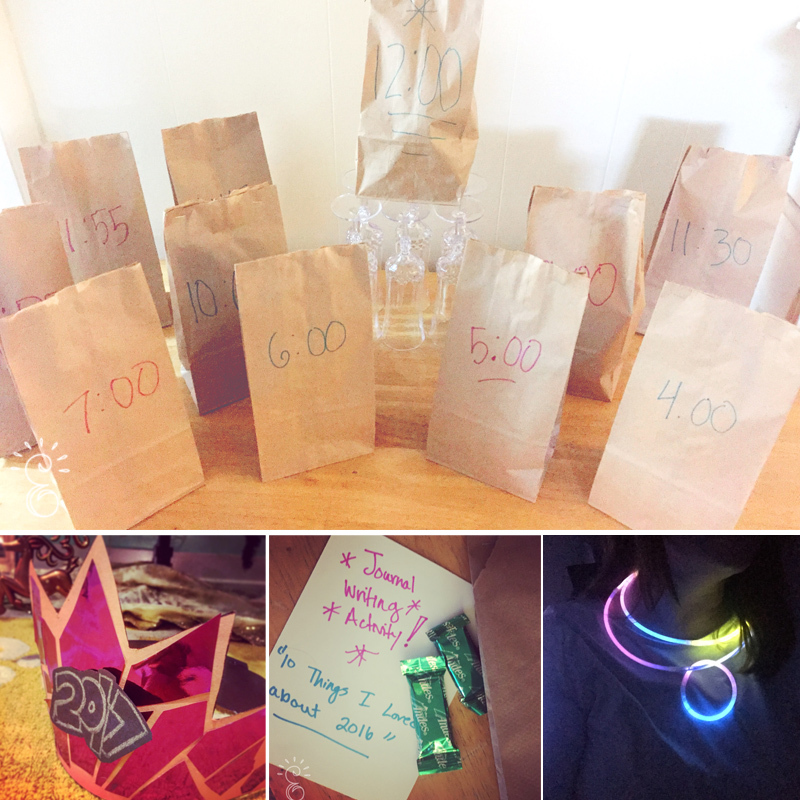 These little countdown bags were a huge hit and I didn't have to put a lot of effort or money into them. I love when something so simple can add such a big impact. These really made our ordinary night in feel like something extra special. 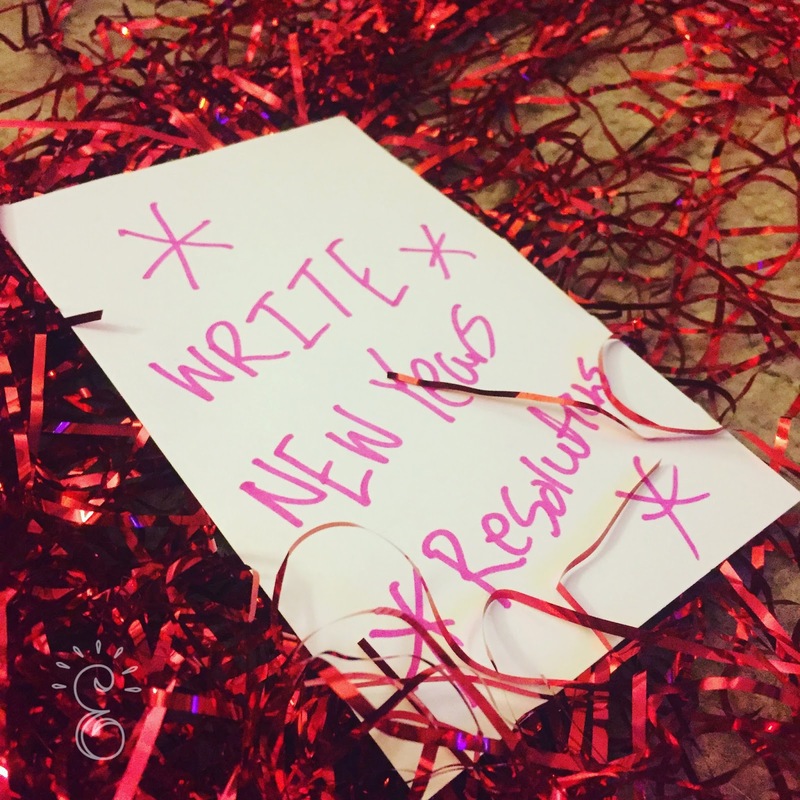 4:00pm: Journal Writing: 10 Things I loved About This Year. We started early at four in the afternoon. 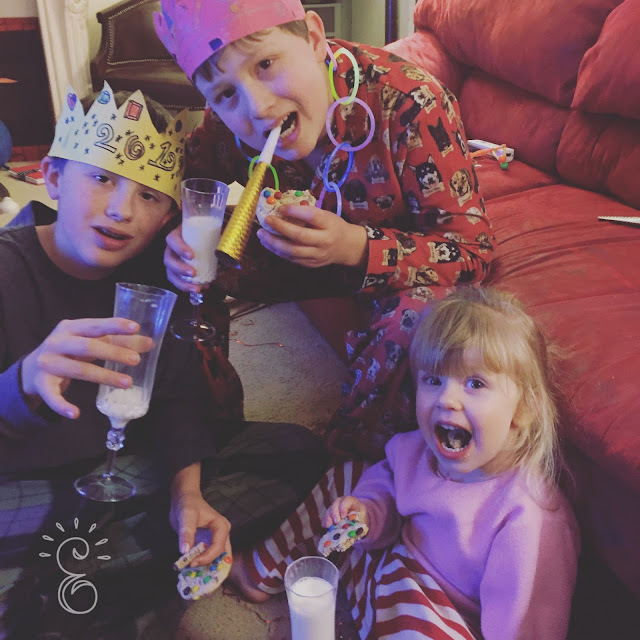 My kids were restless and I wanted to give them things to do to start to get excited about the night ahead. We started the night out with writing in our journals ten things we loved about the year. This is a positive first activity for kids five and up and a great way to reflect on the past year. This bag contained an assortment of different colors and sizes of balloons and It was a great way for us to decorate for the evening ahead. The kids got these cute little water coloring kits in their stockings and I thought it would also make a great little activity that both the toddler and the big boys would enjoy. While they painted I threw some pizza in the oven for dinner. These are a great little craft to do and the kids love wearing the festive hats the rest of the night. You could fill your bags with different glitters and stickers if you like. I just put a note in there saying what activity we were doing and then we just pulled out the crafts supplies and got to work. I surprised the kids with the new 2017 Dance Party Game for the wii. This was a bit of a splurge at $29.00 but was so worth it. It took our whole evening to another level with the fun dancing. Even the baby and the toddler got in on the action. The kids were still dancing an hour later so opening a bag full of sugary treats was perfect to keep our energy up so we could continue to dance the night away. 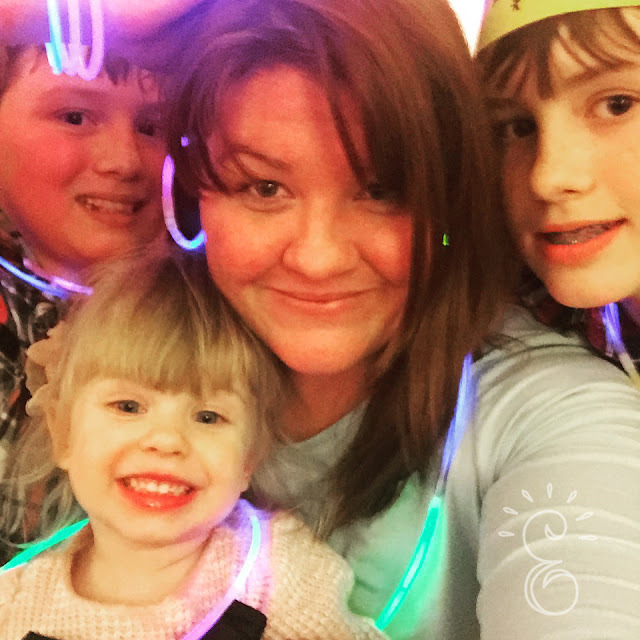 Just when we were starting to slow down on the dancing end of things we added glow sticks to the party. Now we have to dance party in the dark of course! It was a great time to stop and take a break from hours of dancing and write at least three new goals for the new year to come. 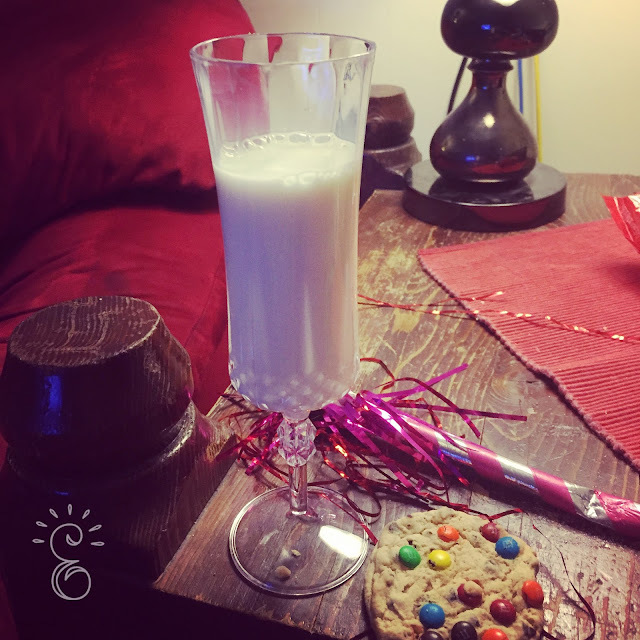 We brought in the new year with a fun Madagascar countdown video on Netflix and some delicious milk and cookies in fun glasses. Everyone crashed within minutes after midnight. It was perfect. 45. Camping in the living room, set up tent, s'mores, ect. 50. 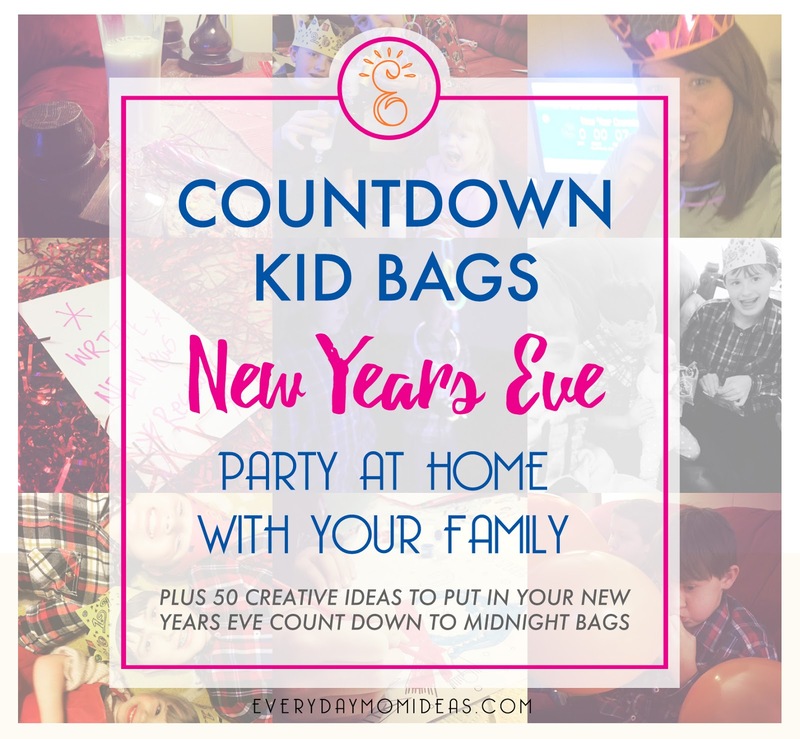 Make a mini new year's eve drop ball. Please share this Pinterest version image below with your friends and family or save it for your next New Years Eve Party at home.